Hello Gates family, cousins, and interested readers. It's been a busy year or so for the Gates extended family. We've taken two Y-tests: one for GATES and one for MYERS. Thanks Bill and Gus for testing! And thanks to all those who donated to pay for the tests! We have waited patiently for the results. BOTH tests returned as haplogroup R-M269, or in old vernacular, R1b1a2. With the same haplogroup, one might think that this meant that our Myers/Maier and Gates/Goetz ancestors were members of the same larger clan. They may have been part of the same larger population but that population appears to be all of western Europe. 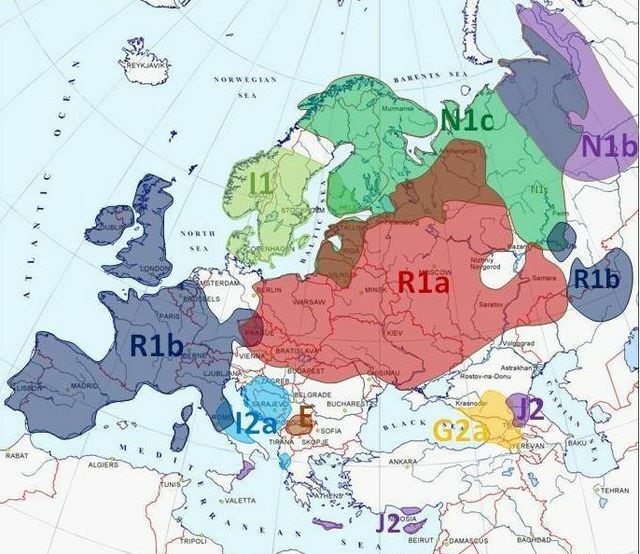 The haplogroup R1b1a2 is the dominant branch of R1b, the most common group in all Europe. Doesn't exactly pin down the ancestors. And then we waited for exact matches who might give us some inkling of our German ancestors...and we waited...and waited...with not much to show. The GATES 37-marker Y-test, in over a year and a half, has netted us exactly 7 matches, all only 12-marker tests ("low resolution"), with no 25 or 37-marker matching results and none with the surname GATES or GOETZ. Different surnames means that those 7 matches are from a time before surnames were adopted, so aren't of any use for genealogical searching. This is a bit of a disappointment. The MYERS 67-marker Y-test, since Oct 2011, has produced over 1000 matches, but also all, except two, were 12-marker tests, and none had the name MYERS or MAIER or variant. A total of two 25-marker tests ("medium resolution") showed up as matches but, their names were Strassman and Baker. Our closest match in all that time is an "almost-match." Although he didn't show up as an official match, I saw his results on The Myers DNA Project, his test listed one line below our Myers test. The almost-match is a descendant of a Franz "DOLLENMAYER," born 1821, Wurttemberg, Germany. Unfortunately, the tester has 12 markers that don't match our Myers/ Maier 67-marker test. Twelve mismatches of markers is 5 too many to be considered a match by the testing company. On the 1870 Tuscarawas, Stark County, Ohio census, seven years before his death, Jacob Maier states his exact place of birth was Wurttemberg, Germany, in about 1810. Same place as our almost-match, Dollenmayer. Might "Dollenmayer" have been a longer name that was shortened to "Maier" at some distant point in history? Is it a fantasy to think of a Mr. Dollenmayer getting tired of writing such a long name? Is it a fantasy to imagine ever getting a match for our German lines? There should be male descendants of our German lines out there, but where are they? On a more positive note, our lack of results in the Y-testing has been balanced by the exciting results of the Autosomal tests ("a-t" DNA). Autosomal testing is a new way of searching for ancestors and is becoming very popular. The Y-test tracks the Y-chromosome which is passed from father to son only. The Mitochondrial DNA (mtDNA) test tracks the mother's line, from mother to daughter (and from mother to son, but only for one generation), but the Autosomal test (atDNA) looks at all the chromosomes, on all the lines, so a woman can take the test. Finally! I have tested, and cousin Barb has tested, at 23andMe, so we are having fun seeing where we have DNA in common and seeing who it is who matches both of us. Since Barb and I are first cousins, how much DNA should we have in common? According to the mathematics of genetics, DNA divides approximately in half with each generation. We get about 50% of our DNA from each of our parents. We have about 50% DNA in common with our siblings. We have about 25% DNA in common with our grandfather, grandmother, aunt and uncle, as well as our nieces and nephews. Think about that for a moment. 25% of your DNA is the same as that of your grandmother or grand father. Your grandchild or your niece or nephew carries about 25% of you. So first cousins should have about, on average, 12.5% DNA in common. But Barb and I have 14.7%! We are on the high end of the statistical range of matching DNA for first cousins. My first very unscientific thought was that the Gates genes were probably extra-dominant. Comparing to others at 23andME, it is most exciting to see that Barb and I have at least 2 other women who match both Barb and me on exactly the same segment of the x chromosome (the x chromosome determines gender). And the two women also match each other. That means that we all 4 have an ancestor in common. But one of the women knows little about her ancestry and the other woman's tree shows no obvious ancestors in common with the Gates lines. It's a challenge, at least, to find the connection. And cousin Marilynn has tested at Ancestry.com and turned up as a match to me. They predict she is a "3rd-4th" cousin match but actually she is a "second cousin, once removed." The "removed" means we're cousins of different generations. Marilynn's father, Carl Weiss, and A.J. Gates were first cousins (they were sons of siblings, Christina Barbara Goetz and John C.M. 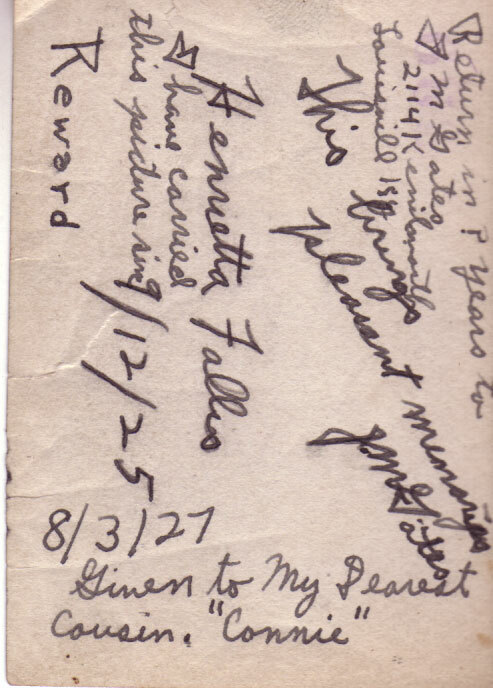 Goetz), so Marilynn and my mother, Connie, were second cousins. I would be a third cousin to Marilynn's daughter. So to Marilynn, I'm a second cousin, "once removed." I can't tell how much, or on which chromosome, Marilynn and I match because Ancestry does not share that information. To compare her test to my test, Marilynn would have to transfer her results to Gedmatch.com, a volunteer-run website that crunches numbers all day for free. My results are already posted there, happily generating comparisons to possible cousins at all hours of the day or night. It's the only place that results from all three companies can be compared to each other. I recognized the name Bunker immediately because I had seen Albert's death certificate and always wondered who the informant "Mrs. Thomas Bunker" was. I should have guessed it was one of Albert's children. Our other most recent new Gates cousins from Texas are also descendants of Albert, some from Mary Jane Gates Bunker and some from Mary Jane Gates' brother, Ned Gates, and sister, Ruth Gates Heath. So our latest Bunker cousin matches DNA of both my two brothers (who also have both tested) and me. He would probably match Barb also, but he tested at FTDNA, not 23andMe. I can see Mr. Bunker's results on FTDNA but I can also compare our results on Gedmatch.com and take advantage of their analysis tools because we both transferred our results. He is also my "second cousin, once removed." Connie and Mary Jane were first cousins, in the same generation. I'm the daughter of Connie but our new cousin is the GRANDSON of Mary Jane. If he were Mary Jane's son, he would be my second cousin, since children of first cousins are second cousins. New cousin Bunker and my daughter would be full third cousins (with no "removed"), both being in the same generation. New cousin Bunker and Marilynn, both second cousins, once removed to me, are "second cousins, 2 times removed" to each other. I confess, I used my genealogy software to calculate that. So, welcome new Bunker cousin! All the Gates cousins on this list are happy to know of you! 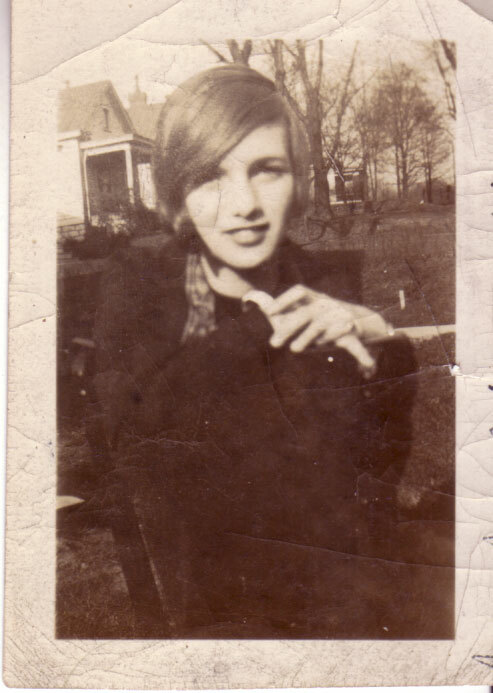 The above photo is Mary Jane Gates, our new cousin Bunker's grandmother, in about 1925. Doesn't she look just like we girls looked in the early 60's? I had that exact hair style in 1959! On second thought, maybe I had that hair style because it was my mother who was the one who arranged my hair that way, teaching me to set the little curls by twisting the hair around her finger and pinning it with bobby pins, like she and Mary Jane probably did in 1925 or so. How times don't change. 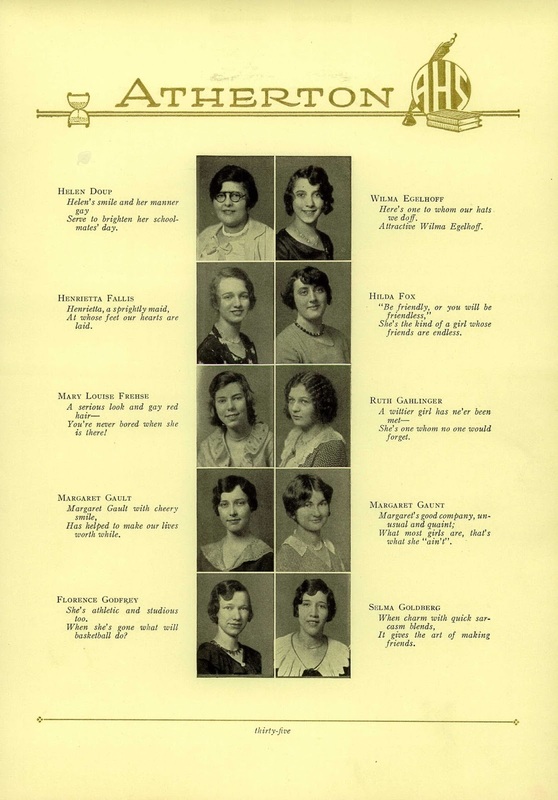 Here are the captions that teen-ager Mary Jane wrote on the back of this photo. "Return in ? years to J M Gates 2114 Kenilworth, Louisville, KY. This brings pleasant memories. J M Gates. I've had this picture in my collection for so long. Finally, I could share it with someone who it was connected to. Maybe I should add on the back of it, "I've carried this photo since 1958."